Beings it was Poppy’s birthday party today, I figured I would give a little show and tell about that 😁. I have been planning for her 1st birthday for a long time. Ever since we knew we were pregnant I got excited about birthday parties. I know I am crazy, haha. When we found out we were having a girl, it helped narrow the choices down. I had a few ideas floating around, but didn’t officially decide until a few months ago. I was stuck between an Alice in Wonderland, Little Red Riding hood, Fairy Tale, and an Enchanted Forest theme. I thought I had made up my mind, but being the person that I am, I knew all of those themes would wind up costing me a lot of money. I decided to do something different in an effort to not spend as much money. I decided to use her room as my inspiration. That way, I could use what was in her room for decorations and only have to buy a few things. The theme is like a floral and lace theme. I know most people go with a lot of pink for a girl’s first birthday, but I am not about that. The colors I went with are red, blue, and ivory. There also are other colors too, but those were the main ones. I knew I wanted to make an area for her cake eating session that wasn’t in the kitchen so more people could fit in the room. I wound up hanging some plastic tablecloths on the wall in the living room. 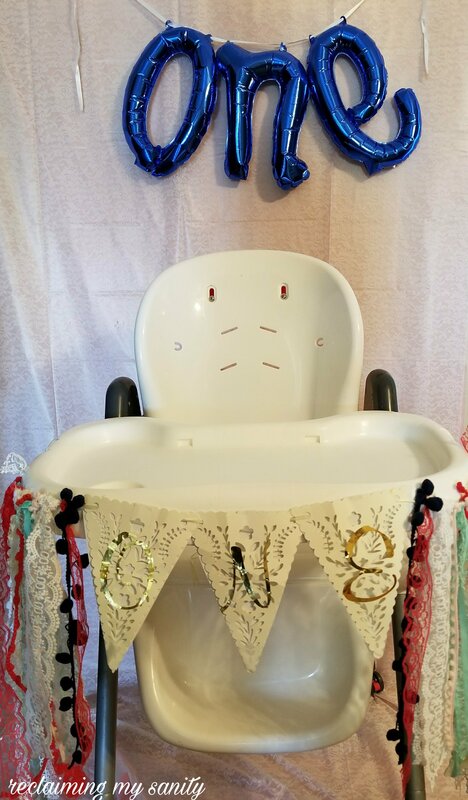 I also decorated the highchair with a ribbon “skirt” and ONE banner that I made. I thought the wall needed something extra, so I bought a ONE balloon from Target online. In the kitchen, I decorated the dining area. 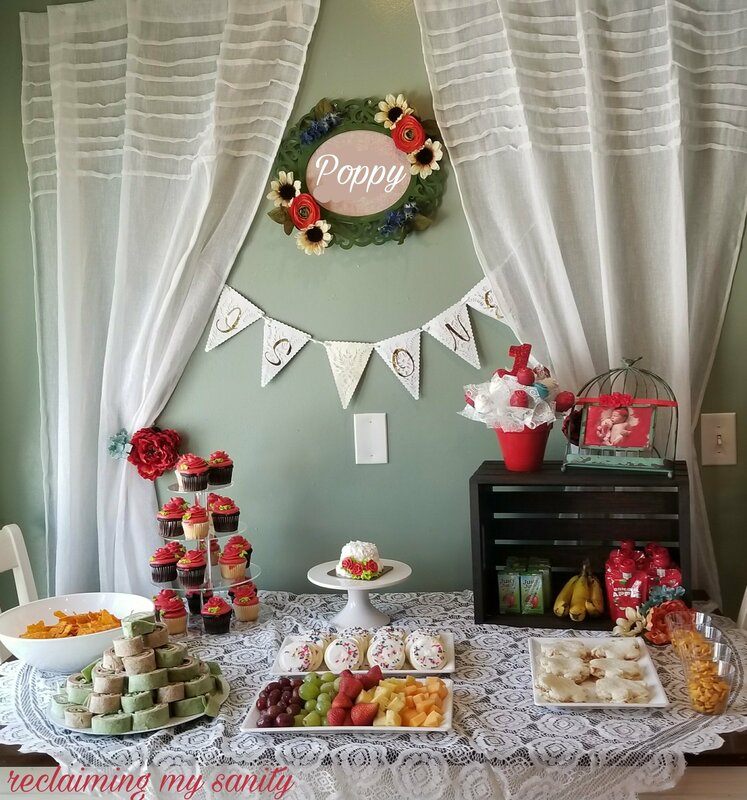 I used her curtains, name thing I made before she was born, and a banner that I made to hang on the wall behind the table. On the table, I got a lace tablecloth (like a doily). We bought a wood crate and stained it. I used her newborn picture frame from her room. 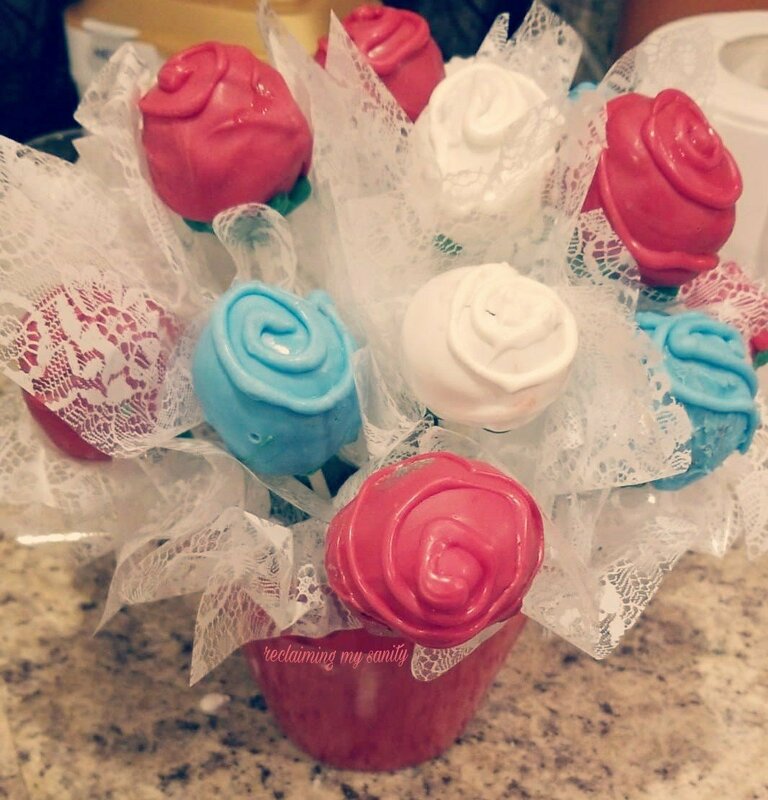 I made rose cake pops and put them in the pot (lace paper came with the pot) that I happened to get for my birthday last month. If you never have made cake pops before, it is a delicate process (you must have time and patience). Here is how those turned out, not too shabby right? As for food, I wanted to keep it simple and tried to keep it low cost. I ordered a pinwheel tray and fruit tray from Target. I used my own plates (bought at Target) so that it didn’t look out of place. I also did chips and cookies. I knew we were going to have other little ones coming so I made a kid section for food. I bought juice boxes, applesauce pouches, bananas, goldfish, and made peanut butter sandwiches cut into flower shapes. I also went to the goodwill a month or so ago and found an ugly picture. It looked like it came out of the 70s. Good news was, I didn’t need the picture itself I just needed the frame. I took it home, took everything out of the silver frame, and Chris spray painted it red for me. A couple weeks went by and I decided it needed some more pizzazz. I wound up gluing some flowers to it (the flowers that started the whole inspiration for her room). I then added some green wire. I got some clothspins and wrote numbers 1-12 on them and put them in order on the wire. 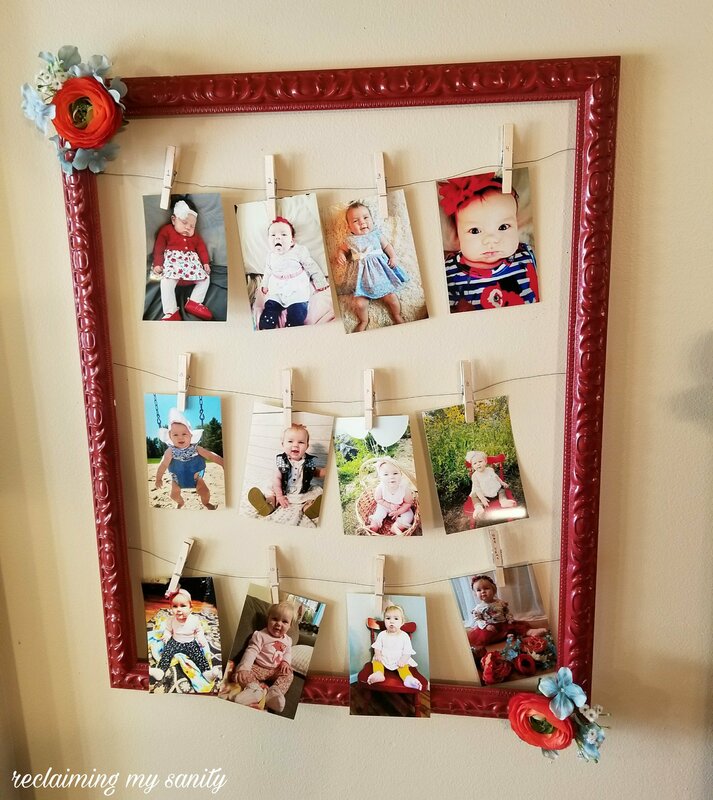 I had pictures of Poppy taken each month printed and put them accordingly on the clips. I think it turned out cute and I can add the frame to her room so she can keep it for a long time. Then there was deciding on a cake. I had so many cute ideas on Pinterest, but I didn’t know how elaborate the decorators at Target would get. I tried to go with something more simple. I did print them pictures of what I wanted so that they didn’t have to guess. (Last year, for Pickle’s birthday Wal-Mart messed up his cake and I had to make them fix it. So I thought the pictures would help avoid that). 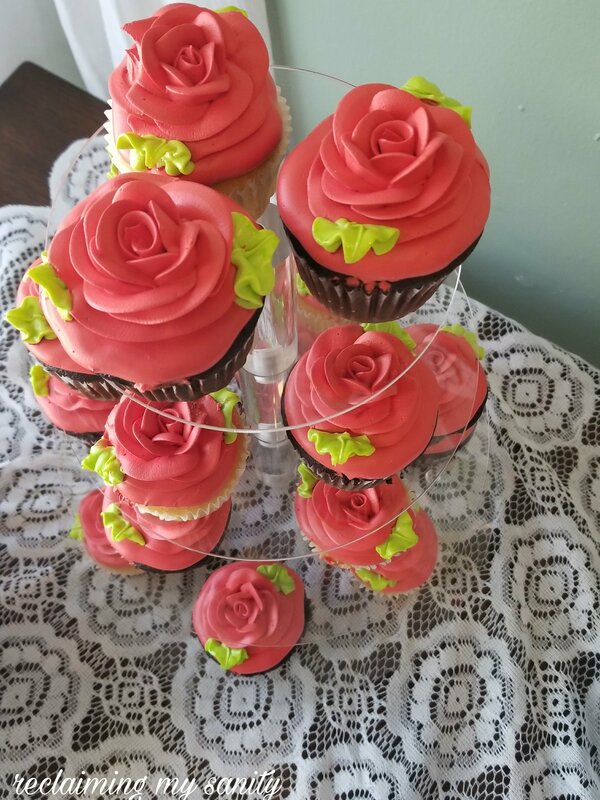 We wound up doing 24 cupcakes with flowers and her smash cake. I was expecting a bigger smash cake, but it was big enough for her. The only thing left is the present drop off area. I only do it so that presents are organized as it can be overwhelming to keep track of if there isn’t a designated spot. Chris wound up moving one of the tables from our room to the living room. Add a table cloth and bada-bing bada-boom, present table. I forgot to get a picture of it, but it was covered with gifts. 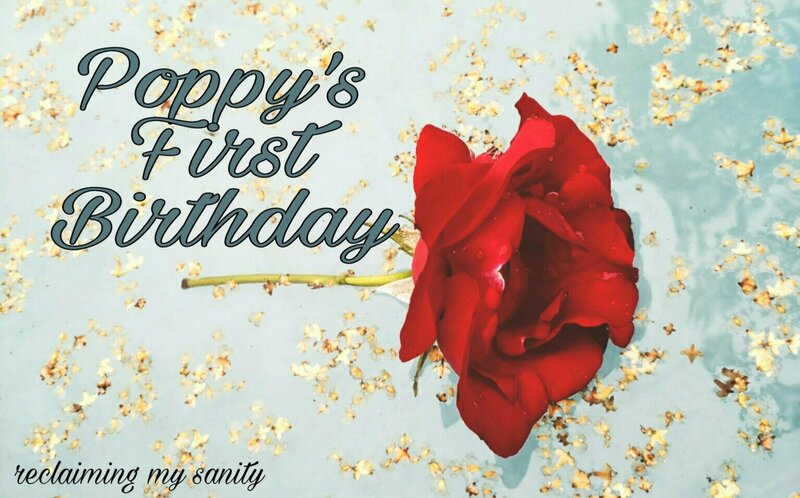 I know kids don’t remember their first birthdays, but all birthdays are important to me. Plus, who doesn’t love looking back at all the pictures? 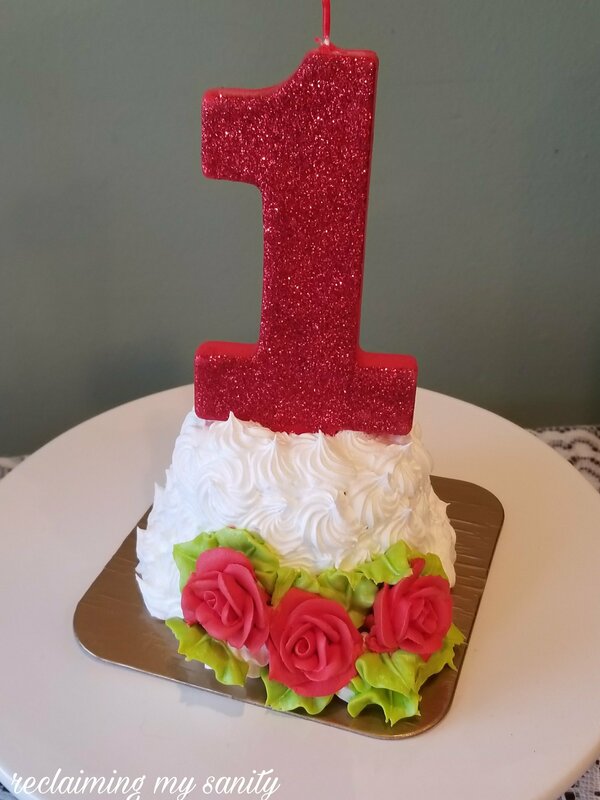 I still cannot believe Poppy is already one! I also cannot be more thankful for having her in our lives. I can’t (but can) wait to see how she changes and more of her personality coming through as she grows. We love her to pieces. Today’s song is inspired by our little miss. That is all so adorable! Super cute and love the song!